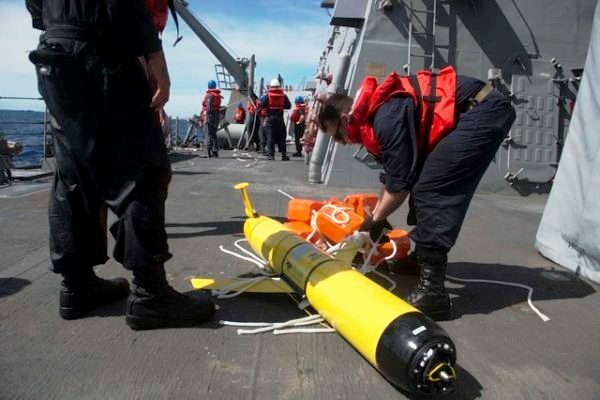 U.S. Pacific Fleet released photos today of a Navy “ocean glider” unmanned underwater vehicle taken Dec. 15 by China — leading to U.S. accusations that the sovereign vessel had been unlawfully seized. Star-Advertiser. The USS Arizona Memorial and Pearl Harbor Visitor Center will be closed Tuesday due to a visit by President Barack Obama and Japan Prime Minister Shinzo Abe, the National Park Service said. Star-Advertiser. Newly found Hawaiian fish is named after the president who expanded its sanctuary. Star-Advertiser. Scientists with the National Oceanic and Atmospheric Administration have named a fish after President Obama. Hawaii Public Radio. The population of Hawaii grew by about 3,400 people between July 2015 and this July. The current estimate for the daily population, according to the latest figures from the U.S. Census Bureau, is 1,428,557. Civil Beat. Federal figures show more people are leaving Hawaii for the mainland than coming to live in the state. Associated Press. Maui and Kauai were in the top 10 least affordable counties according to a new report by ATTOM Data Solutions. Pacific Business News. For the first time in nearly a decade, the state Environmental Council’s 15 seats are full thanks to a slew of appointments by Gov. David Ige. Civil Beat. Lawmakers to consider doubling funds to state-funded drug rehab centers. Hawaii News Now. Do Hawaii Prisons Overuse Solitary Confinement? Most of the islands’ maximum-custody inmates live in special holding cells for up to 23 hours per day. The policy bucks a national trend. Civil Beat. Amid leadership crisis, Honolulu Police Department spent $74K to improve image. Hawaii News Now. Honolulu taxpayers are still paying Police Chief Louis Kealoha's salary even though he temporarily stepped down from his position. KITV. The Honolulu Police Department’s reputation has taken a hit with the chief and four officers being targeted in a federal investigation. Hawaii News Now. The day after Honolulu Police Chief Louis Kealoha took leave amid a growing public corruption case, his wife remains on the job as a deputy city prosecutor. Hawaii News Now. Court cases dealing with evictions on Oahu are down by 25 percent since April with the help of $4.7 million in state funds used to help families stay in their homes. Star-Advertiser. The City and County of Honolulu has been designated as a “High Performer” by the U. S. Department of Housing and Urban Development Section Eight Management Assessment Program for the sixth year in a row, recognizing the city’s ability to provide rent subsidies for low-income households. Pacific Business News. An attempt by the Friends of Makakilo to stop the 11,750-home Hoopili project planned for Leeward Oahu and to limit the Honolulu rail line failed Wednesday after the Honolulu Ethics Commission ruled that key City Council votes enabling the projects should not be overturned. Star-Advertiser. Houston’s NRG Energy Inc., which recently took over ownership of the bankrupt SunEdison Inc.’s large solar farm projects in Hawaii, including some that have been stalled, is making moves to restart these stalled projects, Pacific Business News has learned. Honolulu officials have released a “Blaisdell Center Master Plan Feasibility Study and Conceptual Land Use Plan,” which they say calls for the Arena and Concert Hall “to be retained and renovated.” Civil Beat. Lawmaker will introduce 2 bills in response to albatross cruelty case. KITV. A 19-year-old college student has been charged with animal cruelty, nearly a year after seabirds were found dead at a Hawaii nature reserve. Associated Press. At around noon Wednesday, the first international flight in half a dozen years arrived at the Kona International Airport at Keahole, bringing with it 280 passengers — a full flight — to the Big Island from Japan. West Hawaii Today. A white-tented temporary customs inspection station at Kona International Airport processed incoming visitors Wednesday after Hawaiian Airlines’ inaugural nonstop flight from Haneda International Airport in Tokyo touched down shortly after noon. Star-Advertiser. The federal Nuclear Regulatory Commission is reviewing a proposed radiation monitoring plan for Pohakuloa Training Area. Tribune-Herald. Mayor Harry Kim’s first Cabinet appointee was easily confirmed Wednesday by the County Council, but at least one future nominee might find the going a little more difficult. West Hawaii Today. Hawaii Water Service Co. is seeking sewer rate increases phased in over five years that would more than double its revenues from nearly 880 residential, business and government customers in Pukalani. Maui News. Maui County is slowly on its way to having an electricity-generating facility that will power the Wailuku-Kahului Wastewater Reclamation Facility as well as produce fertilizer that the county could sell. Maui News. A complaint against Maui County Council Chairman Mike White was filed with the Board of Ethics on Tuesday questioning White’s declaration to continue to serve as council chair for the next two-year term before formal public hearings or votes on leadership by the full council, according to a news release sent by the complainant. Maui News. Maui Ocean Center has a special permit to collect coral, which is otherwise strictly prohibited. The team got to be part of a coral recovery operation at multiple harbors across the state, after damage from the 2011 tsunami. Maui Now. In the days following Mayor Bernard Carvalho’s announcement he plans to veto the bill allowing alcohol to be served at Wailua Golf Course, some Kauai County Councilmembers say his reasons are unclear. Garden Island. The only way for Alakai O Kauai Public Charter School to open next fall is for the school to move into an already existing structure. Garden Island. County announces holiday closures. Garden Island.